10 Days Kenya & Tanzania Safari tour is an exciting wildlife safari itinerary taking you across the popular destinations of Aberdare National Park, Amboseli National Park, Maasai Mara National Reserve, Lake Manyara National Park, Serengeti National Park and Ngorongoro Conservation Area. 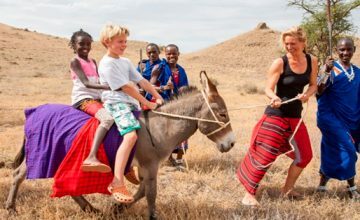 The cultural tours to Maasai Community and the Olduvai Gorge offer a touch of African heritage. The safari starts and ends in Nairobi. Following breakfast at your place of stay in Nairobi, you set off to Aberdare National Park driving past Thika town and eventually arriving the Aberdare Country Club for lunch. You undertake a game drive in the afternoon offering possibilities of viewing Leopard, Elephants, giant forest hog, Olive Baboon, Mountain reedbuck, Eland, Olive Baboon, Cape Buffalo, Side stripped jackal and Black and white Colobus. You take a walk through the soothing forest environment of Aberdare with possible views of elusive bongo antelope. The forest is also home to Ngai – the god of the Kikuyu people. Retire for relaxation, dinner and overnight. Following breakfast set off for the transfer to Amboseli National Park driving via Nairobi and make a stop for lunch. You proceed down to Amboseli and do an introductory game drive as you connect to the lodge for relaxation dinner and overnight. 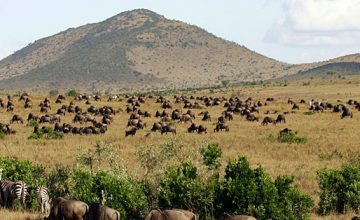 Following breakfast, you undertake a whole day game drive in Amboseli National Park gaining chances of viewing the famous free ranging elephants, other members of the Big five and other wildlife. The surface of Amboseli is also exciting to explore as it can be dusty during dry seasons and swampy during wet seasons. 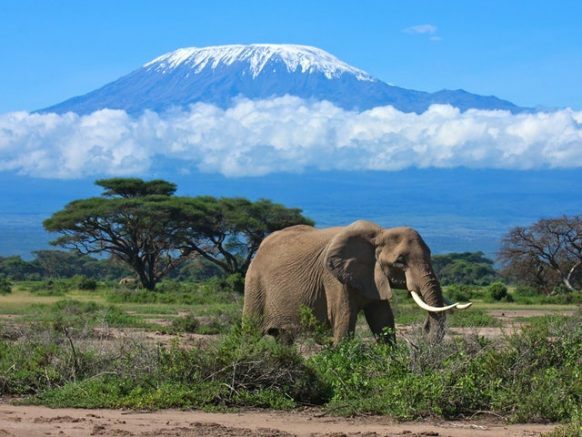 The views of Mount Kilimanjaro – the highest peak in Africa offer a rewarding adventure memory for those visiting Amboseli. Set off from Amboseli after early breakfast to cross the Tanzanian border at Namanga where you will go through the Immigration formalities, change the vehicles and continue to Arusha for lunch. From there, you drive to Lake Manyara National Park for relaxation, diner and overnight. Descend down the crater whose floor supports over 2500 large animals such as Black Rhinos, Elands, Lions, Cheetah, Elephants and Hippos among others. From the game drive, you transfer to Serengeti National Park and if time allows; a stop can be made at Olduvai Gorge to tour the historical museum. Following breakfast, engage in morning and afternoon game drive in the famous Serengeti National Park. 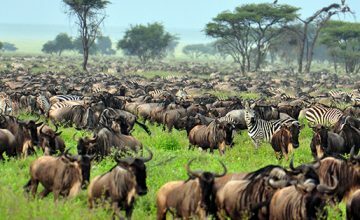 Serengeti features over 3000 Maasai lions, 1000 Leopards, Millions of Wildebeest, hundreds of thousands of Zebras and Thompson Gazelle, Elands, Rhinos and Grant’s gazelle among others. Over 500 bird species thrive in Serengeti National Park and thus offering a rewarding bird watching experience. Drive to Maasai Mara National Reserve with a lunch box crossing at Isebania border where you will change the vehicle upon clearing the immigration formalities. An introductory game drive will be undertaken as you enter Maasai Mara National Reserve. The extensive game drive in Maasai Mara Reserve commences early in the morning following a cup of coffee. 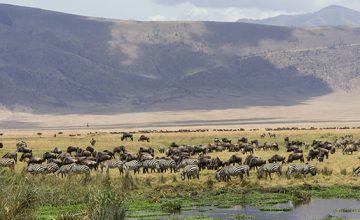 Depending on the season, you can get an opportunity to explore the Great Migration where Millions of Wildebeest accompanied by the hundreds of thousands of Zebras and Thompson Gazelle cross the Crocodile Infested Mara River from Serengeti to Maasai Mara to feed on the abundant grass after which they go back. This spectacular sight is ranked among the Natural wonders of the world. The prides of lions, the herds of Buffalos and elephants, elusive leopards, cheetah among other species may be encountered on this game drive. In the evening, you take up a cultural tour to the Maasai Community exploring their ancient heritage and enjoying their music dance and drama. Transfer from Maasai Mara National Reserve to Nairobi enjoying the scenic countryside landscapes including the Great Rift Valley. Connect to Jomo Kenyatta International Airport for a flight back home or a safari connection to Mombasa coast or Zanzibar Islands.